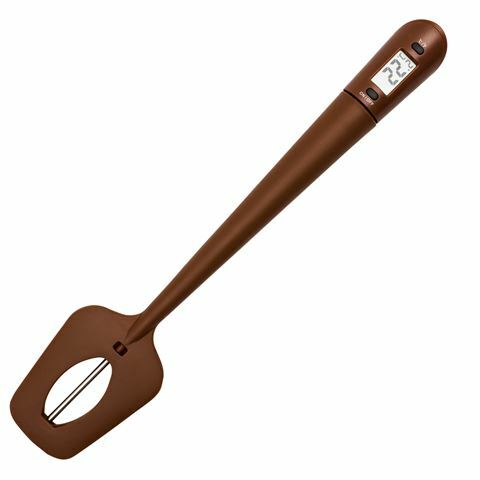 Say farewell to burnt chocolate and spoilt caramelised syrup and say hello to Avanti’s Spatula Thermometer. Crafted from heat-resistant silicone, this humble kitchen utensil has been given a 21st century makeover and is equipped with a highly-accurate digital thermometer that displays the temperature as you stir. Crafted from silicon and stainless steel. Equipped with an instant-read digital thermometer. Displays the temperature in either Celsius or Fahrenheit. Thermometer can be separated from the spatula and used independently. Requires 1 x LR44 battery (Included). Silicone spatula is dishwasher safe. Remove the probe and hand wash in warm soapy water.